Kansas City Southern's most recent quarter didn't live up to management standards, but it was by no means a bad quarter. Based on the way management described Kansas City Southern's (NYSE:KSU) most recent quarterly result, you would have thought that the company woefully missed earnings expectations from weak revenue or poor operations. The U.S.-Mexico railroad company met earnings expectations, though, and its overall operating metrics for efficiency were an improvement on the prior year. So why, exactly, was this a bad quarter? Let's take a look at why management wasn't too happy with Kansas City Southern's most recent quarterly performance despite the respectable numbers as well as what that means for the railroad's stock today. If you were to look at these numbers by themselves, you might think that they were just fine. Volumes were up 4% and revenue was up 6% thanks to ever-increasing cross-border traffic. Mexico's demand for refined petroleum products, chemicals, and crude oil -- combined with America importing autos --makes cross-border volume close to 30% of all Kansas City Southern's total traffic. Also, continuing from the prior quarter, revenue from coal shipments and frack sand both declined thanks to a Texas coal utility shutting down and more oil and gas producers sourcing sand from local sources instead of shipping them from major sand facilities in Wisconsin. On the operational front, the company's operating ratio improved slightly to 62% thanks to lower compensation expenses and a gain from foreign exchange rates. All in all, it would be hard to be too upset with these results. When you look at some of management's comments and some of the operating details, you can see why this past quarter was a bit disappointing. The company faced a lot of congestion issues at its cross-border terminals that resulted in much higher dwell times and lower average velocity for its locomotives, both of these are critical measures of efficiency for the railroad industry. The good news is that some of the congestion is starting to clear. Management expects this issue to carry over into the fourth quarter, but it has deployed crews from less-utilized terminals across Mexico to improve switching times at its two constrained terminals. It's also anticipating modest growth for the rest of the year from its most productive segments -- chemical and petroleum, intermodal, and automotive -- while it faces some headwinds as a result of steel tariffs and declining demand for coal and frack sand. To help investors better understand what exactly went wrong this past quarter with its operations, COO Jeff Songer explained some of the reasons why its cross-border traffic struggled. [O]verall velocity in dwell saw significant impacts related to congestion in our border region. While Houston congestion eased at the start of the quarter, we were not able to work off the backlog of traffic that built in Mexico during that time, which led to elevated volumes entering peak season. This residual excess inventory accompanied by substantial year over year growth and cross-border traffic of 13% and 20% in quarters two and three, respectively, strained our operation in the region. Excessive dwell in our Monterrey and Sanchez terminals was the most pronounced during the quarter. Expanding upon these terminals, Monterrey is a high-volume terminal with significant local daily switching demand across a large number of customers. Elevated inventories have been slow to work off due to the inherent complexity of this operation. Our long-term operating plan for this area is to move some of the switching activity from Monterrey into Sanchez, where we will be able to handle the increasing volumes more efficiently. You can read a full transcript of Kansas City Southern's earnings release here. As much as management voiced its disappointment with this past quarter's results, investors shouldn't get too upset here. Even though the company experienced significant delays at its U.S.-Mexico switching terminals, the company's operating ratio is still considerably better than it was a couple of years ago. These operational challenges are coming from high demand on its network, which is a good problem to have. Also, with 50 new locomotives going into service at the beginning of 2019, the company will be able to increase capacity, improve fuel consumption rates, and likely bring its operating ratio even lower, perhaps even in line with some of its larger peers. This past quarter may not have been Kansas City Southern's finest moment, but there is a plan in place to fix its issues and the catalysts for growth are still in place. 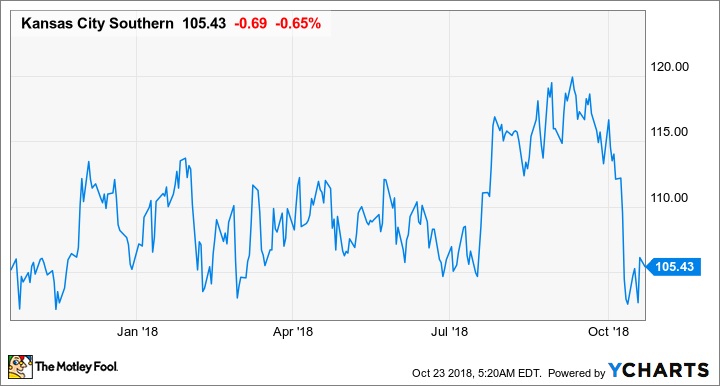 With its stock pretty much flat for the year and trading for just 10 times earnings, it may be time to take another look at this stock.